Materials, processes, and structures engineering (MPSE) practice is experiencing new digital processes, remarkable characterization methods, and unprecedented modeling and simulation capabilities. This modern aspect of MPSE has a common thread; namely, an overwhelming rise in the amount of data being produced and in need of understanding. The convergence of these technologies yields high-dimensional MPSE design spaces that require new knowledge and new optimization tools. Concurrently, the fields of Machining Learning (ML) and Artificial Intelligence (AI) are rapidly expanding, impacting nearly every technological aspect of society. Many thousands of published manuscripts report advances over the last 5 years or less. Yet MPSE practitioners are slow to engage with these advancements. The diverse nature and scant availability of relevant materials data pose obstacles to ML implementation. This overview is intended to draw focus to selected distinguishing advances in ML/AI, and to show that there are opportunities for these new technologies to have transformational impacts on MPSE. Further, there are opportunities for the MPSE fields to contribute understanding to the emerging machine-learning tools from a physics basis. We suggest that there is an immediate need to expand the use of these new tools throughout MPSE, and to begin the transformation of engineering education that is necessary for ongoing adoption of the methods. 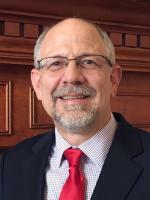 BIO: Before joining The Ohio State University, Dennis M. Dimiduk was Research Leader for High-Temperature Materials, Technical Director of the Structural Materials Division, and Laboratory Fellow at the Air Force Research Laboratory, Materials and Manufacturing Directorate. Through his career he performed research on high- temperature alloys, phase transformations, electron microscopy and strengthening mechanisms in high-temperature superalloys. Dr. Dimiduk led the intermetallics field for the Air Force, conducting in-house research and motivating efforts at other laboratories and universities. Throughout the 1990’s, work by he and his colleagues on titanium aluminides and refractory intermetallics was at the leading edge of world-wide exploration of these materials. Their research led to current growing use of titanium aluminides in gas turbine and automotive engines—a major contribution to fuel savings. More than 25 years ago, Dr. Dimiduk began contributing to and led research seeking to understand the influence of chemistry on microstructure-property relationships and deformation in materials through computer simulation. By the mid 1990’s the group’s successes in materials simulations led to expanded research through DARPA and directly to the community’s current and growing activities for Integrated Computational Materials Science & Engineering (ICMSE). More recently he used those experiences to aid building of the National Materials Genome Initiative (MGI). That research also led to advancements in the 3d materials characterization and representation including the “DREAM.3D” software tool, new techniques for mechanical property characterization at the micro- and nanometer scales and, to discovery of a new regime of size-affected deformation behavior. Dimiduk continues to pursue and explore those advancements, while expanding the impact of ICMSE. Dr. Dimiduk began his career as an ASM Scholar in Materials Science and Engineering and graduated from Wright State University. His M.S. and Ph.D. degrees are in Metallurgical Engineering and Materials Science from Carnegie Mellon University and, he was honored with an Alumni Achievement Award from CMU in 2008. He has also received the Materials and Manufacturing Directorate’s Charles J. Cleary Scientific Achievement Award. Dr. Dimiduk has authored or co-authored more than 195 technical papers, 13 patents, 2 book chapters and co-edited 5 books. He is also known in the academic community for over 10,500 citations of his work. He is a member of the editorial boards for Intermetallics and Integrating Materials and Manufacturing Innovation. In 1993-94 he was a Visiting Scholar at the University of Oxford, UK conducting collaborative research and lecturing on structural intermetallics. Dimiduk is a career-long member of TMS, ASM and MRS. He was awarded Fellow of ASM International in 1997. He is a past elected Chairman of the Structural Materials Division of TMS and served on their Board of Directors. Currently, he is the Chief Technologist at BlueQuartz Software, LLC, a firm committed to tools and methods for structure-based materials systems engineering.